The collapse of Ponte Morandi in Genoa, Italy (read more) and Florida International University pedestrian bridge (read more) have raised concerns about the safety and reliability of existing and new bridge structures. common Defects in bridge structures can affect the overall safety of the bridge structures. 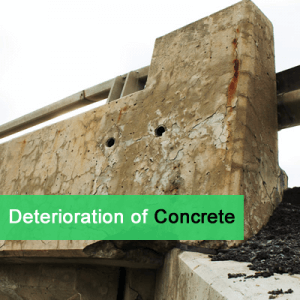 Different deterioration mechanisms can lead to major defects. Exiting infrastructure in developed countries are nearing the end of their initial service life design. 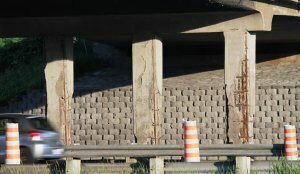 According to the National Research Council Canada, one-third of Canada’s highway bridges have some structural or functional deficiencies and a short remaining service life. The condition of bridges in the United States in not different: According to the ASCE Infrastructure Report Card (2017) “The U.S. has 614,387 bridges, almost four in 10 of which are 50 years or older. 56,007 — 9.1% — of the nation’s bridges were structurally deficient in 2016”. The Canadian Highway Bridge Design Code (S6-14, 2014) considers a service life of 75 years for newly constructed bridge. What does this mean in engineering terms? It means that the bridges of the future should have satisfactory performance, both durability and structural, during the proposed life-cycle. To achieve such service life, a carefully reviewed design and detailing is required. This should be followed by high quality construction work. Finally, a systematic maintenance plan (as part of asset management) should exist to ensure that the performance objectives are met at all times. Several deterioration mechanism can impact the integrity of bridge superstructure (mainly bridge decks). Depending on the material used in the construction of the bridge, different deterioration mechanisms can develop over time. 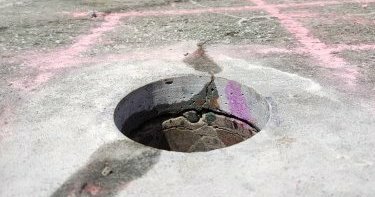 Defects can also happen in the substructure components, such as the foundations, abutments and piers, and the retaining walls. Substructure components can experience the same deterioration mechanism as described in the superstructure. 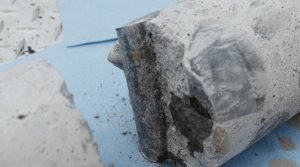 Concrete piers, and abutments can experience deterioration as a results of steel rebar corrosion, freeze and thaw cycles, and alkali-silica reactions. These components can also experience deficiencies in their performance. How to Detect Defects in Bridge Structures? Dr. Layssi is a passionate entrepreneur and professional engineer, and the co-founder of FPrimeC Solutions Inc. in Ottawa, Ontario. As chief structural evaluation engineer, Dr. Layssi brings his extensive experience in the condition assessment of infrastructure. Mr. Layssi holds a PhD from McGill University. He is a registered professional engineer in Ontario since 2014 and was awarded the 2018 entrepreneurship award by Professional Engineers Ontario – Ottawa chapter. 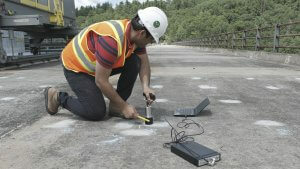 This entry was posted in Bridge, Concrete Deterioration, NDT and tagged Bridge, Concrete, Inspection. Bookmark the permalink.